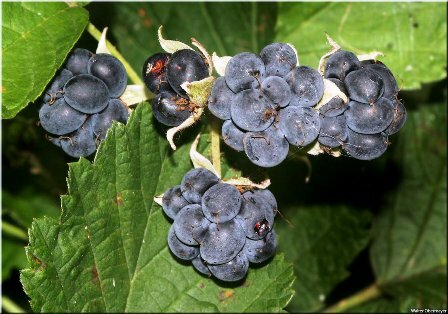 Dewberry is a commonly growing wild fruit in temperate areas through out the Northern Hemishpere. The plants bear dark edible fruits which are sweet. These look like coated with a thin layer or “dew” of waxy droplets. That is why these are called dewberries. In UK, they grow throughout Central & South British Isles but scattered and local in much of West and in Scotland. The plants can be commonly found in disturbed ground, grassland, scrub and sand-dunes, often on clayey or basic soils. A small shrub, 0.5–2 m tall. Leaves alternate, pedicellate, usually trifoliolate; terminal leaflet stalked, lateral ones unequal-sided; all leaflets sharp-pointed, hairy on both sides, toothed, teeth tipped. Flowers borne in racemose clusters, regular (actinomorphic); Calyx-lobes five, long-tapered and sharp-pointed, hairy; petals usually five, free, spreading, 10 mm long, white, with toothed margins; carpels free, many; stamens numerous. Dewberry fruits are juicy. As tartness is on a bit higher side, so these are mot rated very tasty. These are eaten raw. These can also be made into jam and jelly. 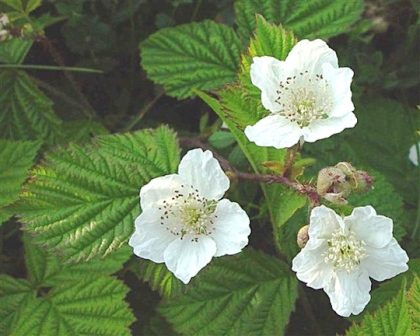 Fresh or dried leaves of a dewberry plant are used as a tea substitute. Dewberry mostly grows wild. However, its plants are also planted sometimes in gardens for collection or specimen plants. It has been observed that dewberry plant has a no specific soil preference and can grow on all type of soils including very those which are even quite alkaline. 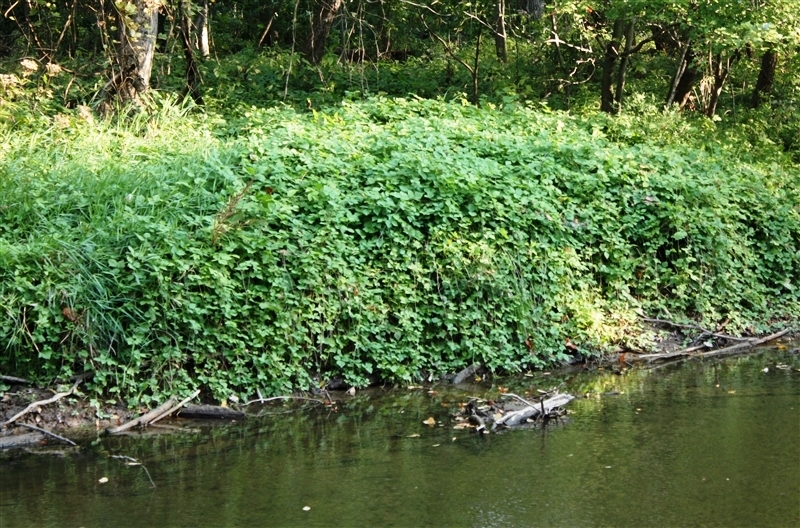 Dewberry plant has biennial stems. It produces a number of new stems each year from the perennial rootstock. These stems fruit in their second year and then die. It is susceptible to honey fungus. Dewberry can be propagated from seed. The seeds, however, require cold stratification. Asexual propagation is possible from semi-hardwood cuttings and tip layering done in the month of July.